1 of 6 In small bowl, whisk vinegar, mustard, honey, garlic, salt, pepper and thyme. Gradually whisk in oil until well blended. Stir in 1/2 cup crumbled cheese, mashing slightly. Remove 2/3 cup dressing to plastic food-storage bag. Add the shell steaks; seal. Turn to coat; marinate 10 minutes. 2 of 6 Prepare outdoor grill with hot coals, heat gas grill to hot, or heat oven broiler. 3 of 6 In bowl, gently toss zucchini and 2 tablespoons of remaining dressing. 4 of 6 Remove steaks from marinade. Grill or broil 2 minutes. Flip over. Top each with 1-1/2 tablespoons remaining crumbled cheese. Grill 2 minutes for medium-rare. Remove to platter. 5 of 6 Grill or broil zucchini slices until tender, about 2 minutes per side. 6 of 6 In bowl, toss together greens, zucchini, onion, remaining dressing and any remaining crumbled cheese. 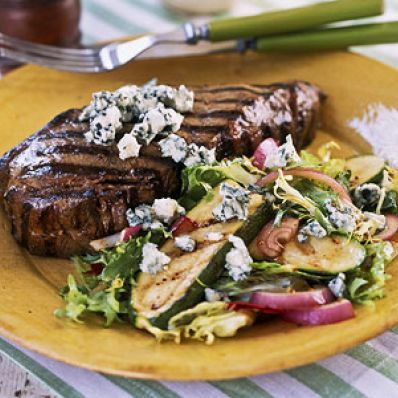 Serve salad alongside grilled steaks.